Saray Hotel is a 3 star hotel located in Nicosia, the capital of Northern Cyprus. 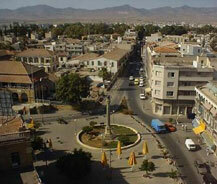 The Saray Hotel is the first motel in North Cyprus. This hotel incorporates 72 rooms with air conditioner, casino and also a disco. All these made the hotel to appear at the moderate class hotel in Europe. As many hotels are run by family and any other foundations, the Saray Hotel is being run by Vakif which is a regional foundation. The hotel is the base for all other hotels as this is the first one in and around that area. The hotel was started constructing during 1959 and the construction work finished after three years. Thus marked its opening in the year 1962. It is still running successfully without negative remarks and with great name. In the 72 rooms Saray Hotel can accommodate 144 beds with facilities like satellite TV, mini bar, direct telephone line, bathrooms with shower, safe case and facilities for making tea and coffee. The hotel incorporates an American bar with live music presentation all round the time for entertaining the guests. A disco facility which allows the guests to entertain at the most and they could have fun all round the time here at Saray Hotel. Guests of the hotel are always welcome and they are greeted with warm hospitality and service.